Tamco Tools offers a full line of silica dust attachments for your air tools, including rivet busters, chipping hammers, paving breakers and rock drills. Our dust extraction system uses only air - NO electricity needed. This simple system uses a Venturi vacuum to remove dust at the work surface. 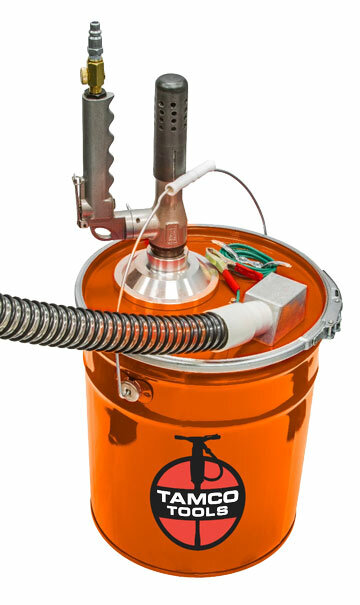 The TAM3P VDEX Bucket uses water to filter silica dust. Using water eliminates the need to replace expensive HEPA filters, keeping operating costs low. Tamco Tool's VDEX system is a simple, easy to use solution to Silica dust extraction. Chipping hammer attachments are universal. We can supply the correct VDEX retainer for all major brands of chipping hammers. Please tell us which style tool you plan to use. Rivet Buster attachments are adaptable to all brands and styles using Jumbo Steel. 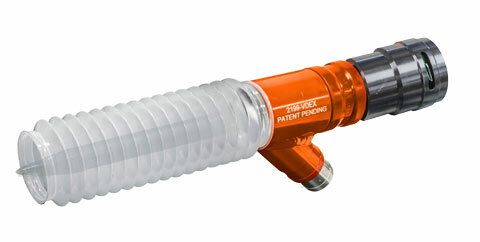 Our VDEX attachment uses an extended lower sleeve for easy replacement and maintenance. Rock drill attachments are currently available for small hammer drills. Paving Breaker attachments work will all size breakers and rock drills, including 30lb, 40lb, 60lb and 90lb.